rpgnewb wrote: 1) on page 14 the lieutenants have HD and hp i really don't understand why they have both can someone please explain? This should be fixed in R27, I believe I corrected those stat-lines. Solomoriah wrote: Morgansfort is set in the Western Lands, a sketchy campaign area I put together for a game I never published, then reworked for Basic Fantasy when I needed one. It is not the same world as Glain. Is the current Western Lands map all there is?Is it meant as a sandbox? 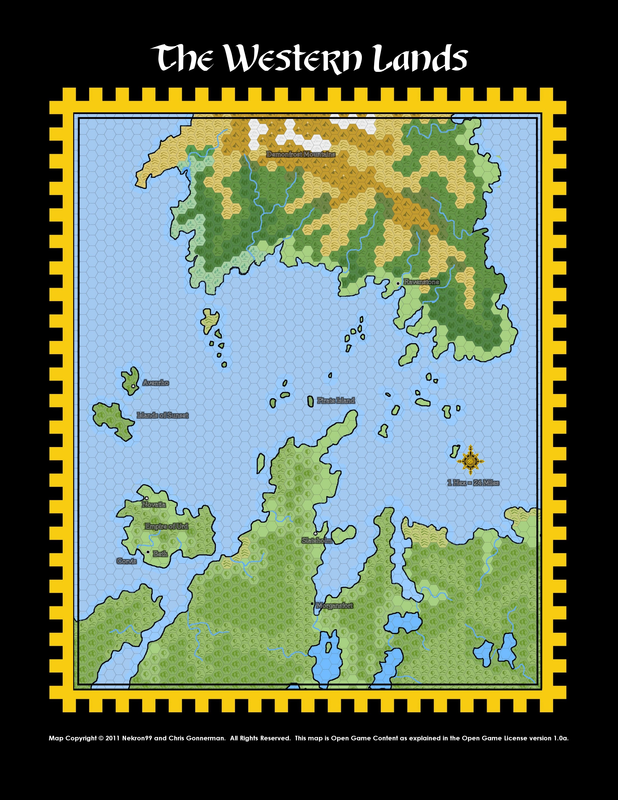 Yes, that's pretty much all there is, though I'm slowly developing the area near Morgansfort in my new campaign. Is it meant as a sandbox? Well, that's more or less how I use it. The reason I'm asking is there are only about 4 cities on the map, for a pirate adventure the area of operation would be modeled after the Spanish main or Eastern US coastline and probably would need some place to hide and / or places to raid. How were the color maps of the Western Lands made? bhyeti wrote: How were the color maps of the Western Lands made? Which ones. At least a few are just community contributed. I think somebody did one in crayon that was absolutely beautiful. I found the same one in the forum without the border, I think it was in Artwork. They have a free and pro version. Personally, I'm fond of xfig. It's ancient but for the kind of things many maps need it's entirely sufficient as a vector drawing program. Granted, it probably wouldn't scale too well, but (a) I know it and (b) it's free. The Chartographer's Guild probably has a lot more information about map making in all kinds of software if you're interested. They have some incredible artwork there, some so nice I'm thinking of asking permission to print and frame it. This probably needs it's own thread, I want to start a pirate campaign but need a bigger support base, it's hard to loot and pillage with only a handful of cities. the Western Lands map is about 415,000 square miles, a small chunk of Europe. I want to make a Mediterranean Sea type area to the east of the current map.